(Sharing between different modes of travel: by foot, bike, car etc..). If the modal split is skewed towards motorized traffic, it must be balanced to the benefit of walking and cycling in particular - active modes. The street must be walkable. And bikeable. We must build a coherent global system of movement that offers real alternatives to the car, and not only gives room for but also supports active transport. If frontal sharing is unbalanced, and unfair advantage is given to traffic or parking cars, the street life is canceled or sterilized. Balancing the frontal sharing means giving some leeway to adjacent habitants, and reactivating the frontages. If the frontages are nonexistent, they need to be recreated, and simple robust frontage architectures should be designed to allow second sites. 3- A third type of sharing is also at issue : sharing the production of the habitat between the formal and informal, between monetary economy and non-monetary domestic economy (home economics…). We must give back space for second sites and self-production of the habitat and its streets. We must know how to welcome second sites, both spatially and socially,. And therefore, know how to design flexible and robust architectures and how to write flexible and robust rules that regulate and restore possibilities for spontaneous actions to the habitants, and how to accompany them. - « modal sharing 50 / 50 » = travel by car should not represent more than 50% of trips in an urban system, the rest being active modes and public transport. 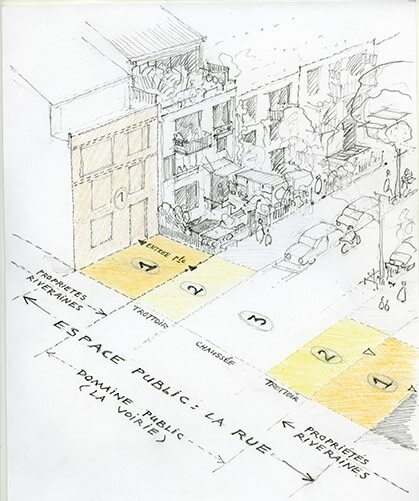 - « frontal sharing 50 / 50 » = ensure that cars ( traffic lanes and parking spaces) do not occupy more than 50% of the street space, the rest being dedicated to public and private active frontages. These goals require large scale, collective decisions. Brook principle: small streams make a mighty river. No matter how small, every source counts. Nurture all initiatives and potential second sites no matter how trivial they may seem. Shelf principle: design adjacent architectures a little bit like shelves to be filled with appropriable frontages that can host second sites. Gardening principle: once the site is prepared, care must be taken to cultivate spontaneous processes - they must not be abandoned. Instead they must be welcomed and accompanied, they require incentives, mediation, arbitrations - the work of an attentive gardener. The decline of our streets is not a new thing. But the economic crisis and development of the Internet and social networks transforms the situation even more. This new context emphasizes the need of rebalancing on both sides of the frontage line our public and private lives, to constitute a vibrant and practical public space. The streets are the heart of the issue. When streets are in bad shape, missing or dull, there is an opportunity to take action, as long as we are aware of possibilities and paths of action. This book is an attempt to contribute.